The Chi-Nu II is a premium Rank III Japanese medium tank with a battle rating of 3.7 (AB/RB/SB). 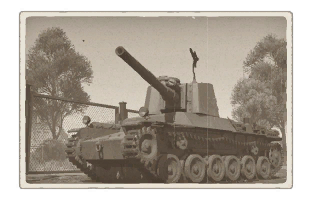 It was introduced with the initial Japanese Ground Forces tree in Update 1.65 "Way of the Samurai", but was released once all the Rank III Japanese tanks were available to the public in the Closed Beta Test. It costs 1,600 Golden Eagles. The Chi-Nu II is essentially the Chi-Nu body with the turret from the Chi-To, giving the tank access to the high-power Type 5 75 mm. The Chi-Nu II is a combination between two vehicle, the Type 3 Chi-Nu and the Type 4 Chi-To. It has the armour of the former, but the gun of the latter. Thus, while presenting itself as a more vulnerable body with only around 50 mm of armour, it has slightly better mobility than the Chi-To, a smaller profile, yet carries the same gun. Like the Chi-To, the Chi-Nu II should be played in a sniper-like format from a distance rather than up-close to the enemy and fighting them in close-quarters. Ammo racks of the Chi-Nu II. Against the medium tanks, its simply getting the first shot off first as the 75 mm Type 5 cannon on the Chi-Nu could penetrate most through the front hull armour, with some levels of difficulty on the turret. Of course, for maximizing the Chi-Nu's own survival, attack from the sides and make sure the enemy is unaware of the Chi-Nu's presence. 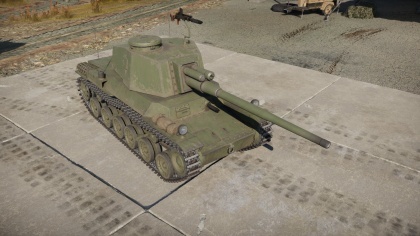 The Chi-Nu II can meet heavy tanks, but will most likely be the 76 mm KV-1 series tanks, which the 75 mm can easily punch through the front armour. The Chi-Nu II can still meet the British Churchill Mk VII, which is impervious to the high-penetrating 75 mm from the front, so beware if caught in a frontal engagement. Powerful 75 mm cannon rivaling the T-34-85 for its BR, good penetration and very low shell drop-off. Decent gun depression of -10°. Good handling, same as Chi-Nu. Narrow chassis allows access through areas inaccessible by wider tanks. Chi-Nu's 50 mm armour is vulnerable to most incoming fire. Most part of armour is only lightly sloped, even the turret. Angling front armour can expose weaker 35 mm side armour. The lackluster performance of Japanese tanks in World War II called for the development of newer medium tanks in the Imperial Japanese Army. The standard tank of the time was the Type 97 Chi-Ha, which has its chassis used in many expedient models to provide a bigger gun for the Japanese inventory such as the Chi-Ha Kai, Type 1 Chi-He, Type 2 Ho-I, and Type 3 Chi-Nu. Two new sophisticated tanks were also in development, the Type 4 Chi-To and the Type 5 Chi-Ri, both fielding the powerful Type 5 75 mm gun. However, these two tanks still needed time to iron out some design bugs, time that the Japanese did not have while being stared down by the Allied powers. To get the Type 5 gun out to their forces as fast as possible, designers sought a way to get the gun onto a vehicle as fast as possible. The solution laid on the Type 3 Chi-Nu, regarded as one of Japan's best tank since its production start date in 1943. The Chi-To's prototype models had larger turrets that were different from the main production model. 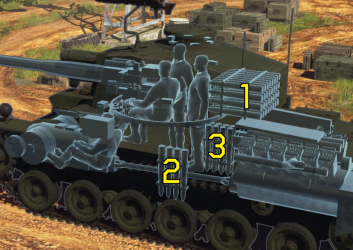 Instead of wasting these turrets, the Japanese decided to use them on the Chi-Nu body. In March 1945, a Chi-To prototype turret was attached onto Chi-Nu chassis #37. This upgraded Chi-Nu, along the line of the Chi-Ha's upgrade, was informally labeled the Chi-Nu Kai. The design was tested on the Irago Firing Grounds on March 19th and proved itself very satisfactory in combat roles. The final design was to equip the Chi-Nu with production model Chi-To turret to increase production levels and it was to help improve Japan's armoured forces to stand up against the Allies' might. This Chi-Nu with the production Chi-To turret was known as Chi-Nu II. Like most of the Japanese late-war tanks developed and retained in the home island for the "final defense", the modified Chi-Nu and its counterparts never saw battle against Allied armour. Japan surrendered in September 1945, effectively ending World War II. A few Chi-Nu IIs were made before the end, but they are most likely sent to the scrap yard along with most of the other Japanese equipment with their demilitarization. This page was last edited on 16 March 2019, at 18:02.